Welcome to 2019 (almost). Let’s make the next 12 months a year of gratitude. I know that the more gratitude I have in my life, the better it becomes. There is no upper limit. There’s more to being truly grateful than just saying, “Thank you.” Below is a great story about Yolanda Willis’s journey to escape the Holocaust and the strength gratitude can have on your life. You have to do more than just speak words — gratitude is an action. Keep a gratitude journal and write in it at least 2 -3 times a week. If you do this you will be less depressed, slept better and have lower levels of inflammation. See the study below. I don’t journal, but I write down three items a day that I am grateful for and a year or two ago, I started expressing gratitude internally throughout the day. Say thank you more than you think you should. How about saying thank you to the people closest in your life—we tend to take them for granted. As it turns out, only 52% of women and 44% of men express gratitude on a regular basis. Even more surprising was that only 10% of the 2,000 people surveyed said they thanked their professional colleagues. Give yourself some gratitude. Every day. Self-talk works. Positive affirmations and gratitude to yourself is a powerful way to live each day. Thank you for reading my LIFEies. I am very grateful for the readership AND for all the thoughtful replies I get each week. I have learned more from this community than I have given. Gratitude affects all areas of your life. Saying thank your aloud or internally expressing gratitude can leak into other areas, allowing you to develop a deeper sense of humility and joy. A simple “thank you” isn’t always enough. Yolanda Avram Willis has spent much of the past two decades finding out as much as she could about the families who risked their lives to save her Jewish family during the Nazi occupation of Greece. She wanted to chronicle their good deeds and give thanks—and do so before it was too late. “I’m 83,” she says. “I don’t know how long I am going to be around. I wanted to do this while I have my mind.” Her mother and aunts suffered from some forms of dementia. Ms. Willis recently completed a book about her family’s experience, “A Hidden Child in Greece: Rescue in the Holocaust,” which she self-published through Authorhouse. The process helped her, too, giving her purpose and deepening her appreciation, says her son, Martin. “The act of writing can help flesh out experiences and makes you understand things better,” he says. Gratitude is good for us in many ways. Studies have shown that it strengthens our immune systems, helps us sleep better, reduces stress and depression and opens the doors to more relationships. But to reap those rewards, we need to do more than feel grateful, says Dr. Emmons. “The word ‘thanksgiving’ means giving of thanks,” says Dr. Emmons. “It is an action word. Gratitude requires action.” It might mean composing a letter, or posting a photo and caption on Instagram. Most people aren’t very good at it. Only 52% of women and 44% of men express gratitude on a regular basis, according to a 2012 gratitude survey of 2,000 people in the U.S. funded by the John Templeton Foundation, a philanthropic organization that supports academic research. Those who are religious or spiritual tend to be more grateful, as are married couples, says Janice Kaplan, author of “The Gratitude Diaries,” who conducted the survey. Younger people—18-to-24-year-olds—express gratitude less often than any other age group, and when they do, it’s often for self-serving reasons: in the hopes that people will be nicer to them in return. People can get better at being grateful, but it takes practice. Dr. Emmons recommends keeping a gratitude journal. Writing one to three times a week about people, events and things that make you feel grateful is more effective than daily entries—and don’t worry about grammar. It’s important to be specific so you can realize all that went into an effort. When giving thanks to someone, either in person or in writing, avoid the sweeping “Thanks for everything” or the “Thank You for Being You” approach, which can come across as impersonal. Paul Mills tried out the idea with a group of about 50 to 60 heart patients at the Center of Excellence for Research and Training in Integrative Health at the University of California, San Diego, where he is director. The patients kept journals for two months, recording things they were grateful for. Family, friends and nature topped the lists. Some wrote only a few words, others wrote pages several days a week. But everyone who kept a journal was less depressed, slept better and had lower levels of inflammation than those who received the usual care but didn’t keep a journal, Mr. Mills says. “There seems to be real benefits to gratitude,” he says, noting that the old adage “A grateful heart is a healthier heart” rings true. People are understandably most grateful when something good happens. Finding gratitude in heartache, loss, pain or trauma is more difficult. But it can also help us become more resilient and deepen our appreciation of what we do have, including the people who helped us through. Ms. Willis, who wrote about her experiences during the Holocaust, was 6 when war broke out in Greece, forcing her well-known Jewish family to flee their home. For the next four years, they were constantly relocating to avoid capture and bombings, hiding in caves and on farms, adopting Christian aliases. She and her younger brother, Yannis, were separated from their parents, each sent to live in the homes of Christian strangers befriended by her father. A baker and his family took Ms. Willis in, saying she was their goddaughter whose parents couldn’t afford to feed her. Later, she lived with a widower she called aunt. Ms. Willis never knew her parents’ whereabouts, the thinking being that if she was captured, she might reveal their location. After four years in hiding, Greece was liberated and the family was reunited. Her father, Salvator, was often gone, traveling for work. Her mother, Karolla, always kept his place set, with a starched white napkin for when he returned. Ms. Willis devoted herself to her studies and eventually went to the U.S. on a Fulbright Scholarship to study chemistry. She settled in Pittsburgh, married, raised three children and obtained her Ph.D. in sociology from the University of Pittsburgh. 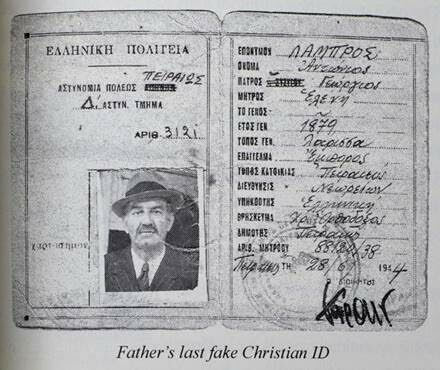 Her parents and brother remained in Greece; her father died in 1965 and her mother in 1987. In 1992, her brother died. Troubled and erratic as a child, Yannis was eventually diagnosed as paranoid schizophrenic. Although they were never close, Ms. Willis says, his death touched her deeply and sparked her search of their past. She made the first of several trips back to Greece in 1994 and was reunited with her rescuers. 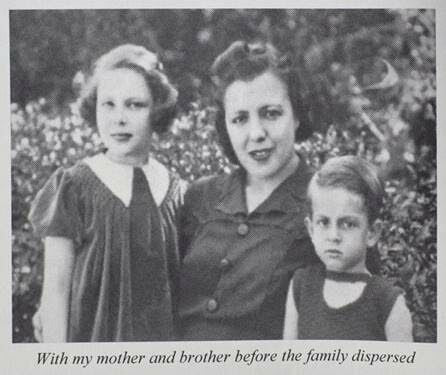 Over the course of decades and interviews, Ms. Willis discovered that the baker and his family who took her in were forced into hiding and hunted by the Nazis for hiding her. “It took multiple encounters for the story to come out,” she says. “With each encounter, I learned how much they had given.” She remembers weeping in her hotel room while listening to her taped interviews. It dawned on her, too, that the dozens of others who hid her family in caves and on their farms, who forged documents to give them Christian names, had likewise endangered their lives. In her book’s dedication, Ms. Willis lists each of the 20 people who helped along the way. Many of them have died, but some of their children and grandchildren are alive. It’s important for them to know their parents’ selflessness, she says. 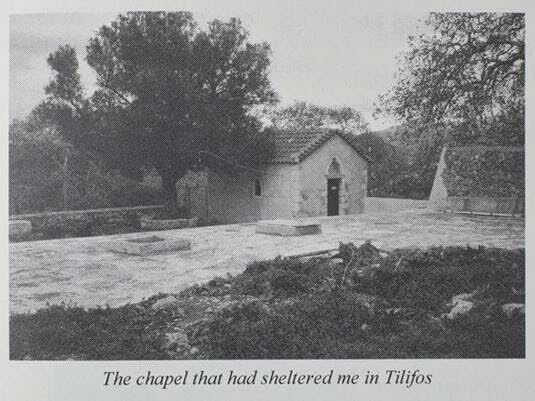 Ms. Willis also dedicated her book to her parents, “who taught me gratitude.” During one of her return trips to Greece, she learned that her grateful father had returned to Crete every Easter to celebrate the Christian holiday with her rescuers.